The best weekend getaways start with an incredibly beautiful way to get there, so beautiful, that the journey becomes its own reward. That’s how every vacation to San Juan Island begins, no matter your method of travel. Nestled in the northern corner of gorgeous Washington State, protected from rain by the Olympic Mountains and Vancouver Island, surrounded by the sparkling Salish Sea and all its wonders, San Juan Island feels like worlds away, but is actually only 65 miles north of Seattle. Here are three easy ways to get to our little island paradise. Which unforgettable journey will you take? In the shoulder or off season, it is practical to have a car on San Juan Island, especially if you plan to venture to all the beaches and parks outside of town. The Washington State Ferry runs from Anacortes to Friday Harbor year-round, several times per day. Reservations are recommended. The crossing takes about an hour and your fare, paid in Anacortes, is round-trip. There is food service on most sailings, puzzles on the tables to be started or finished and room to roam after sitting in the car. The ride is stunning. The ferry route was designated one of Washington’s Scenic Byways in 2015 and it’s easy to see why. The islands are former mountain tops of a receding continent, much older than the American Mainland, carved by glaciers millions of years ago. You can also leave your car in Anacortes and walk on the ferry, which lands in downtown Friday Harbor. You don’t need a reservation to walk on, just arrive at least 30-45 minutes ahead to make sure you have time to park your car and buy a ticket. Insider Tip: When you leave the island, park your car in the ferry lanes a bit early (you can do so as soon as the ferry before yours left) to do your souvenir shopping in Friday Harbor. From late May to early October the Clipper Ferry offers day trips and overnight packages from Pier 69 in downtown Seattle to San Juan Island. 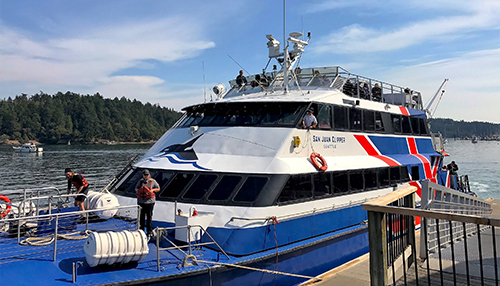 The comfortable 3½-hour cruise aboard the passenger only, high-speed catamaran San Juan Clipper is the fastest and least stressful way to get to Friday Harbor by boat. 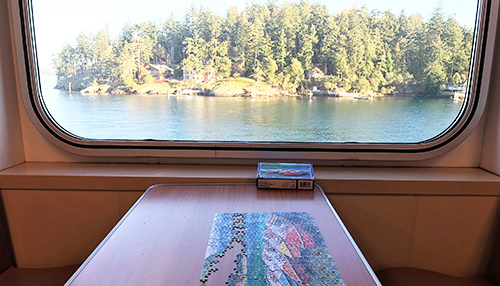 Sail through the breathtaking Deception Pass and see the 180-foot-high, historic Deception Pass Bridge from below, watch for wildlife and learn about this amazing part of the Pacific Northwest from an onboard naturalist. Enjoy freshly made, local snacks and beverages, including locally distilled spirits onboard or bring your own picnic. Insider Tip: Arrive early and find a table by the window. The fastest and most adventurous way to get to the island is via a small plane with Kenmore Air. Fly high above the glistening Puget Sound and arrive on the island in just 45 minutes. It is breathtaking to see this gorgeous part of the world from above and maybe even spot some whales. Kenmore offers sea- and airplane rides directly to San Juan Island from Lake Union in downtown Seattle or Boing Field, as well as lodging packages and connections to and from SeaTac Airport. Insider Tip: For a little extra adventure, ask if it’s possible to sit next to the pilot and co-pilot your flight.